During the game, players need food to feed their clans so they can expand into new territories. Food is gained by clans in areas using tools and knowledge. Food comes in various forms and each token of each type is worth different amounts of food (crops=1, berries=2, fish=3, bears=3, mammoths=4). The board is a landscape of hex zones each with a food type in the centre and split into 3 areas. Turn order is critical during the game and is based on who has the most clans tribes on the board (ties split by the player with the highest numbered technology card). In most cases, whilst being most advanced, being first is usually the worst position. Each round, a series of phases takes place. First, players buy new technology cards: tools that let you hunt food, and knowledge which gives you various abilities. Next to the board are 8 technology cards each with a tech rating number – the higher the rating, the more advanced the tech. The 4 cards with the lowest tech ratings are the ones that are available for purchase. The food board with cute pieces showing what total food is available for the players' hunts this turns, as well as showing how many clans each player has on the board and player order. The first player in turn order selects one of the 4 lower cards and then, in reverse turn order, players say if they want to buy it for its marked price in food. If no-one else buys it the player that selected it must buy it. Once a player has bought a technology, they drop out of this process for this round and a new card is added to the 8, with the lowest 4 tech ratings now being for purchase. This process keeps happening until all players have bought one technology. Then, players without the fire knowledge must discard 1/3 of their food as it rots. Next, players gain food by hunting. For example, a player with a fishing tool, and with at least 1 clan member in an area next to a lake, can take some fish. The more clan members a player has next to lakes (players can only have 1 of their clans per area), the more fish they can collect. Also, more advanced fishing technology cards can earn more fish depending upon how many fish are available. However, there is a limited amount of each food type available each turn so some players can end up not being able to gather the food their tech would usually allow. Players then feed their clans, costing 1 food per clan, or unfed clan members are removed. 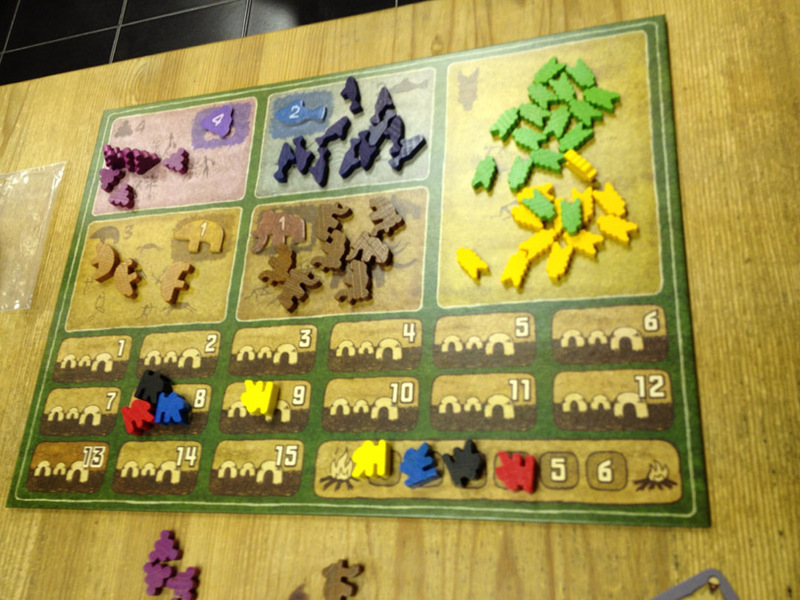 Then, in reverse player order, players can add up to 5 clan members to the board adjacent to their existing clans. Placing new clans costs food (the more added in a turn, the more expensive they are) and these cost more food if placing clans in areas where there are other players’ clans. Finally, players update the turn order, replenish the food board, and the highest tech card is put underneath the draw pile. Turns continue like this until any 1 player has clans in 13 or more areas, at which point the round is played to the end and the player with clans in the most areas (not necessarily the player that triggered game end) wins. Power Grid: The First Sparks is a very tight, economic game where players must match their technologies with their clan placement, opponents’ clan placement and tools, and available food to make progress and expand. This makes it rich in interesting and tough decisions with tension whenever any other player is deciding what to do in case they make things harder for you. Player order is absolutely critical. Being first player is usually worst because you hunt last (so many food types may not be available) and you expand last (which is often more expansive because other players have already expended). First player does get to pick which tech is up for sale first but only until they buy a tech card. I think this system works really well as it’s a great balancing mechanism so that the player who is doing best has it hardest, and vice versa. It’s good to be part of the pack, or just behind it, so you can get the benefits of being last but can then go for the win at the right time. I really like the tech card buying process. It manages to create a natural evolution of tech as well as giving lots to think about tactically. Selecting which tech to put up for sale is a very interesting decision as you need to consider who else may buy it before you get a chance to; however, you shouldn’t put something up for sale that you don’t want at all (if no-one does either) because you’ll be forced to buy it. The technologies create interesting mixtures and there’s lots of thinking to do about which mix would be best based on your current clan placement and potential spread. Finding technologies that work in harmony with your tactics is important especially because you’re limited to a maximum of 3 tools. Whilst simple, The First Sparks can be brutal if turn order means you don’t get much food and you’re not able to get tech that works for you. Also, other players placement can make it too expensive to expand, and/or deny you the tech you really need too. So, don’t be fooled by the cute food tokens, this can be a harsh and unforgiving game – but that’s why it’s satisfying. The one negative I found was the currency which is (mentally) fiddly because each type of food is worth different amounts. My maths is excellent but it’s just not immediately apparent which is higher: 3 bears, 1 mammoth and 2 berries, or 4 crops, 3 fish and 1 bear. As a result, you can’t quickly see how much players earned (to get a sense of how well/badly they/you are doing), or how much you own for spending on clan spreading or feeding. Calculating the cost of placing clans is a bit fiddly too which is compounded by not being able to quickly assess how much food you have (because that’s two calculations going on at once). Also, you can’t be sure of your exact expansion cost until it’s your turn. As a result, I don’t think I planned very accurately like I would usually try to do in a game that requires it such as this. There is one last item I must mention and that is the list of Achievements the game comes with. These are a series of situations you can recognise as having achieved by recording them on the list. Some items are more about recording events (like who won the first game each year, the first time a player wasn’t able to feed their clans), but others are more linked to gameplay like players that won without ever having a spear, or simply having 4+ knowledge cards, etc. I think this is a brilliant idea as video games have had achievements for some years (primarily since Xbox Live started using them) and are now on all other platforms (including iPhone versions of board games). I use them a lot in my work where I create game systems for advertising agencies too as they’re a great way to add other objectives and rewards which are additional to the game. Whilst purely a bit of fun, including achievements in an actual physical board game is a superb idea. 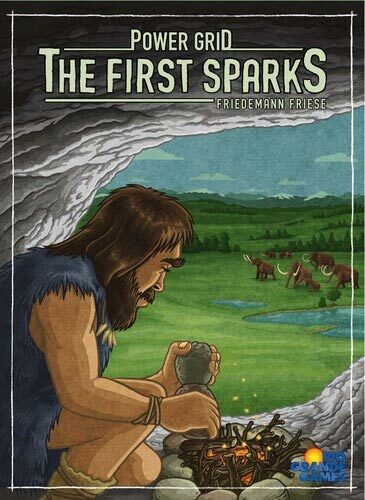 Overall, I enjoyed playing The First Sparks as it packs lots of thinking and interaction into a relatively short game. For those who have played Power Grid, what’s it like in comparison? The First Sparks is very similar but is faster and simpler to play. The key difference is that there’s no auction when buying cards – you either purchase or not. I liked this a lot as it made things faster and it meant that players in competition over a specific tech didn’t end up paying higher prices than those who are not (plus other players can’t purely risk a bid in order to push a price up). I didn’t find I was able to plan ahead as much as in Power Grid. I’m not quite sure why as the same elements are there; in fact, they’re a bit simpler because all resources are the same currency (not separate coal, oil, radioactive), and there’s no limit to the number of players in each area. I think this was mainly down to calculating the total food (mentioned earlier) and not being certain of your income. If you like Power Grid, The First Sparks gives you a faster, simpler version but without being completely identical. It’ll be personal preference whether you do or do not need both games in your collection. 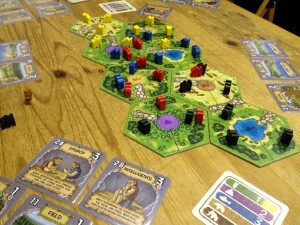 This entry was posted on Thursday, November 24th, 2011 at 2:17 pm	and is filed under Board Game Review, Board Games, Essen Spiel 11, Power Grid The First Sparks. You can follow any responses to this entry through the RSS 2.0 feed. You can leave a response, or trackback from your own site.